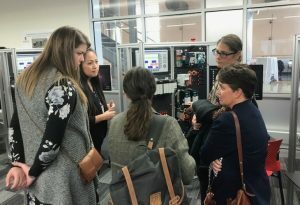 Thanks to a partnership with industrial automation giant Rockwell Automation, engineering students at the University of Wisconsin-Madison can get their hands on today’s most advanced industrial manufacturing technologies. 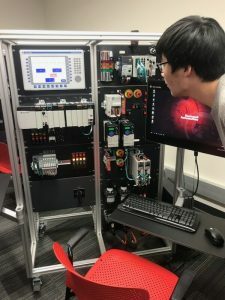 The Rockwell Automation Industrial Connected Enterprise Laboratory in the UW-Madison College of Engineering will support undergraduate coursework as well as faculty, staff and student research projects. The new lab was unveiled on Oct. 15, 2018. 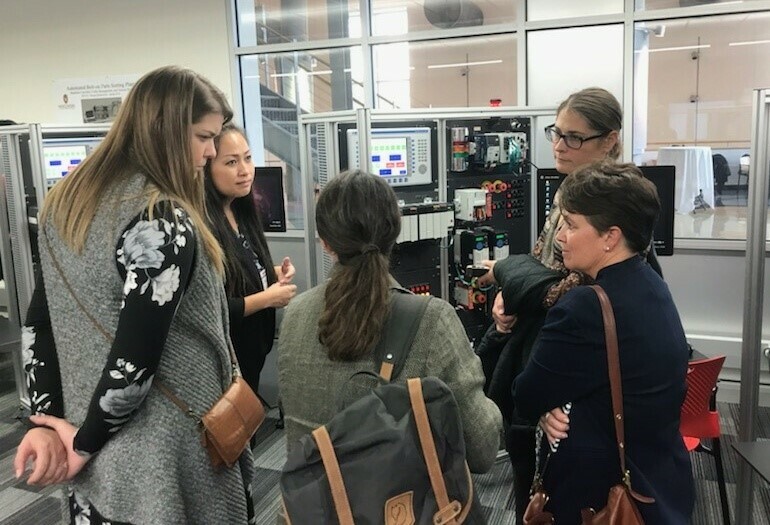 Mao Lee, (second from left) Industrial IoT Development Lead at Rockwell Automation talks with visitors to the laboratory. That familiarity will give Badger engineers an important leg up when they enter the job market. And, companies need highly-skilled workers. “Rockwell has a mission to expand human potential,” says Rockwell Automation CEO Blake Moret, whose company has a long history of supporting initiatives in the college in both research and education. “Automating mundane tasks allows human workers to focus on challenging problems that need critical thinking.” Part of that mission to expand human potential includes inspiring and educating tomorrow’s workforce. 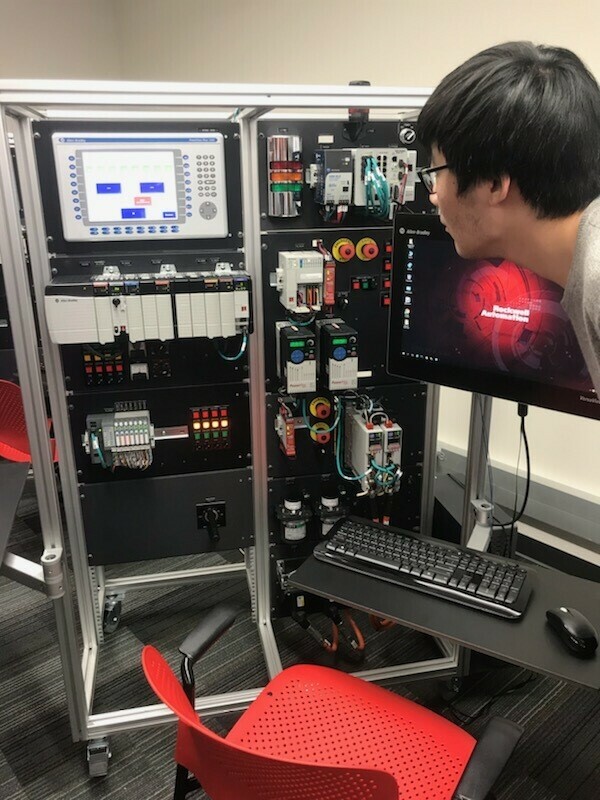 A student explores the laboratory set up supplied by Rockwell Automation. “As a state school, there are great opportunities at UW-Madison to enhance partnerships with industry,” says Thoma. 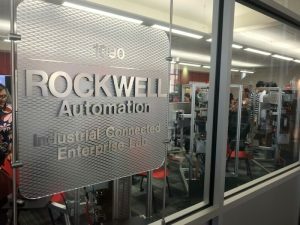 “Rockwell wanted to make sure that its technology is a part of the educational mix.” The company did just that—filling a room on the main floor of the Engineering Centers Building on campus with a suite of Rockwell technology for students to put through the paces. The lab will support undergraduate coursework as well as faculty, staff and student research projects. 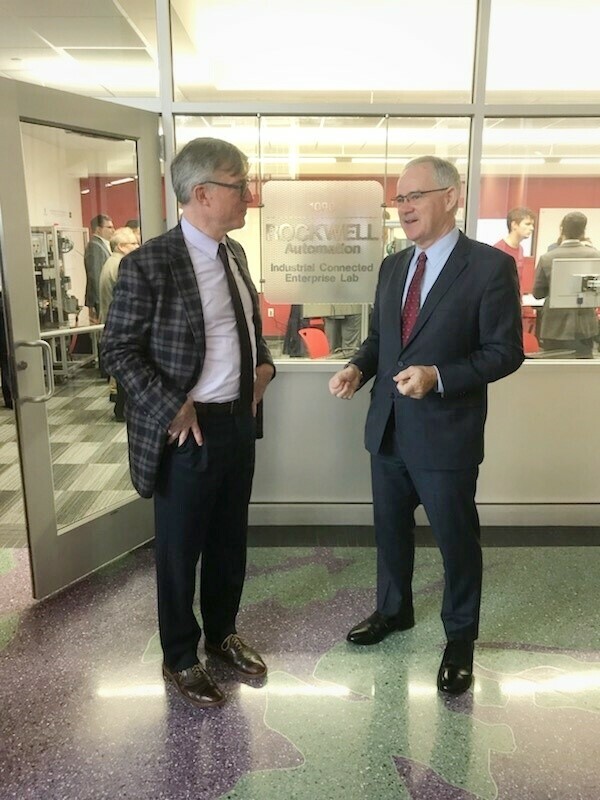 Blake Moret, President and Chief Executive Officer of Rockwell Automation (left) and College of Engineering Dean Ian Robertson connect after the opening of the laboratory. And, the lab’s capabilities will continue to grow in the coming years. Plans are already in place to add new flexible automation systems and an industrial data center. It’s a win-win situation. UW-Madison engineering students have the chance to gain real-world experience in a one-of-a-kind facility, while at the same time, Rockwell can ensure that future generations of engineers join the workforce with above-par technical skills. “The lab is and will be a space that connects people with ideas and technology, serves as a springboard for innovative research and solutions, and adds an additional level of knowledge and preparation for our students,” says College of Engineering Dean Ian Robertson.